The rumors are true, Zippy has been resurrected! I knew I wanted to knit Jason this sweater, but even as the weather grew cold I just could not bring myself to go back to the Smart Superwash I started with last year. It felt too scratchy to me, and doubling it made for too stiff a fabric. 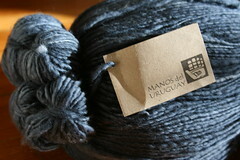 Once I allowed myself to start considering other yarns, the solution was clear: Manos. It's the yarn the pattern calls for, the color selection is awesome, and -- to be honest -- Jason deserves fabulous yarn. Especially for his first hand-knit sweater! I dragged Jason to Wild & Woolly in Lexington, MA on New Year's Eve to pick out his color. He walked in, looked at the wall of Manos and almost instantaneously said "That one." Ah, to be a guy and decisive about garment colors. Now I know that people in the Boston area -- including me! -- have mixed feelings about Wild & Woolly, but I went there because I knew they had a particularly wide selection of Manos. (And there is a limit to number of stores I can drag Jason to in one day.) They didn't have enough of the color he picked, so I ordered it. This is when I learned the real advantage to getting Manos at W&W: the Manos distributor is in Lexington, so I got a call the next day that my yarn was already in! Hurrah! It's a super-skein! An uber-hank! Has anybody ever received their Manos like this? It's 10 skeins, lashed together with three pieces of yarn. 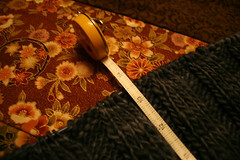 I wish I'd put something in that picture for scale, because it's an enormity of yarn. I was actually a little sad to take skeins out to start knitting. (A very little. It is Manos after all.) My only complaints? 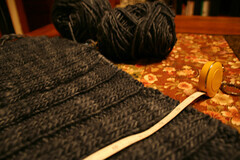 It catches and splits very occasionally on my needles, and the thick-and-thin took a bit of getting used to. But the color variation and general squooshiness of the yarn more than makes up for it. Yum. Oh, and one more thing! Alison made me out to be some kind of knitting over-achiever, having arrived with four inches of work before she even started. What she graciously did not mention, however, is that on that very same night (after a long conversation on what "lightly blocked" means) I re-measured my work both with a measuring tape and around Jason's waist only to find that I had no choice but to rip it all out and start again with smaller needles (9s this time). I've done that, and am on the right track now gauge-wise... but I'm sure I've got some catching up to do! Even though I fear that saying so will instantly bring on a freak April blizzard, I can no longer restrain myself: spring has arrived in Boston. Mercifully, gloriously, FINALLY -- we have survived another winter! Past springs have seen increased activity here at Casa Gringa, and I'm hoping that I can get back in the swing of things this year as well. Let me start by introducing you to two projects I've been working on without bothering to blog about. Pinky Socks: When I finally decided that I can want to make the socks after all, I immediately became enamored of self-patterning socks. After I finished these little numbers, I started surfing around for new options. I stumbled upon Sweet Georgia's gorgeous pink, red, and orange-y socks and had to have them, stat. 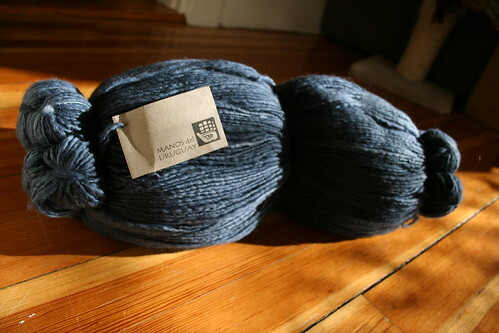 It took some sleuthing, but I finally found the yarn: it's Regia Jubilee 4-ply and the colorway is India. (It's hard to find -- the place I bought it no longer carries the colorway!) And Georgia wasn't kidding about being able to make at least three socks from a skein; I'm planning to make a matching pair for a baby or toddler with my extra. Jason's Zip-Up Raglan: During the Wild & Woolly sale in January, I picked up a big bag of Smart Superwash in Navy Tweed. I didn't have a particular pattern in mind, but I did know that it would be a sweater and that it would be for Jason. It turns out that if you knit two strands of Smart together on US10s, you get the exact gauge called for in Men's Zip-Up Raglan in Last Minute Knitted Gifts. Zip-up sweaters are Jason's favorite kind, so it was a perfect match. So now that I've introduced you to those two lovely projects, I'm taking them away. Yep, just like that. 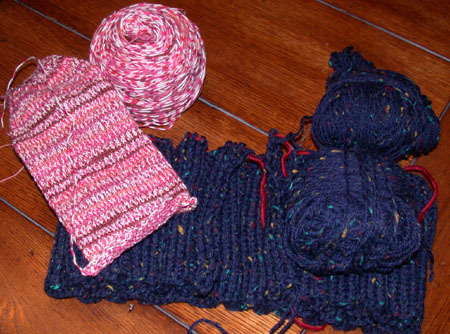 These woolly, heavy, cold-weather projects are going on the back burner while I enjoy spring and summer. Bring on the cotton!